Just a regular CR player who happens to moderate this forum. Send me any questions or concerns you have! 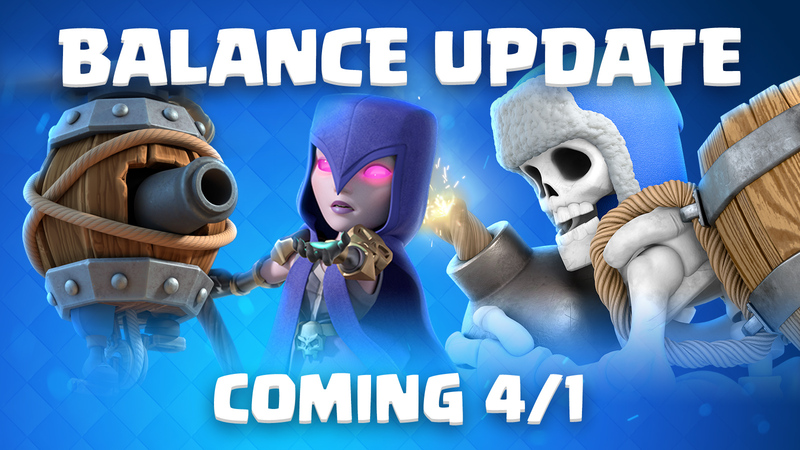 [OFFICIAL] Balance Update Live (4/1) - Witch, Flying Machine, Bandit, and More! In this balance update we're taking a look at Witch, Flying Machine, Bandit and more! In order to make both Witches more similar mechanically, we have added a spawn of 3 Skeletons when the Witch is destroyed. This buff to the under-performing Witch provides a bit of compensation when she goes down! Flying Machine has consistently been one of the highest win rate cards in the game, flying (haha) under the radar for the most part. Last month’s Barbarian buff has made Fireball Bait a strong deck (as intended) but it nudges Flying Machine just a bit over 60% win rate, so we are slowing down the Hit Speed slightly to bring it more in-line with other cards in that deck. Ram Rider’s Bola can be a very frustrating debuff that appears to some players as a bug or full stun. We wanted to reduce the repeating full-slow element against cards like Hog Rider. Therefore Ram Rider’s Bola will greatly reduce, but not fully stop, enemy Troops. Giant Skeleton could use a few ‘quality of life’ boosts. We are happy with his Hitpoints and Damage, but a faster first attack should help him inch closer to the Tower, especially against small swarms like 1-cost Skeletons. On defense, a heavier mass will allow him to hold his ground better against incoming Giants, as his big bones won’t be pushed around so easily. Bandit remains one of the strongest two-way cards in the game, often connecting with the Tower with the tiniest sliver of Hitpoints. For only 3-cost she is outshining the other melee cards, so we are giving her a small reduction in Hitpoints. Recently Lava Hound has risen in popularity, while one of the best buildings to counter a slow moving air assault has been on the sidelines. Increasing the Spear Goblin count from 11 to 12 will make Goblin Hut a more formidable counter to Lava Hound decks and other tanky pushes. Let us know what you think about these changes below! I'm not 100% sure but can you press and hold on one donation until the eight cards are donated? Can you be more specific about its HP? Like enough to survive fireball, but not lightning (or something). Also, I assume it's a legendary in Spooky Town?